The Goshen Art School kalimbas are legendary in their beauty and silky feel and sound, but they are made in very limited numbers. 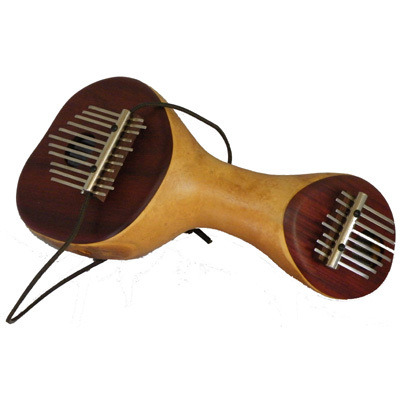 Made with beautiful paduak wood from Africa on a specially-shaped gourd, these beautiful instruments provide a special way for two people to connect. One side has an 8-note kalimba, while the other side has an 11-note kalimba tuned to lower notes. These are easiest to play when tuned to A, which permits the 8-note side to cover the octave with A in the low note and the high note. Made with beautiful paduak wood from Africa on a specially-shaped gourd, these beautiful instruments provide a special way for two people to connect. One side has an 8-note kalimba, while the other side has an 11-note kalimba tuned to lower notes. These are easiest to play when tuned to A, which permits the 8-note side to cover the octave with A in the low note and the high note.